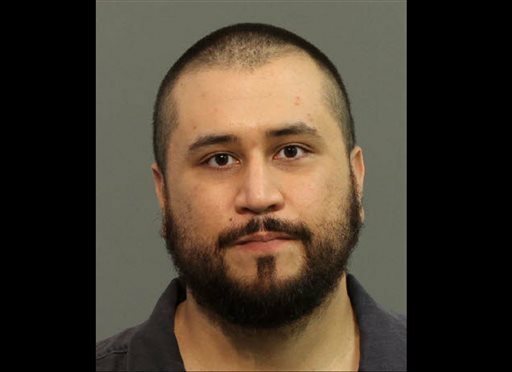 George Zimmerman out on Bond; On Electronic Monitor and Must Stay Away From Guns; but Will he Make it Through the Holiday Without Getting Violent? George Zimmerman was released from jail on Nov. 20 after posting a $9000 bail. The murderer of teenager Trayvon Martin was arrested and charged with felony assault, battery and criminal mischief last week. Zimmerman was released on the condition that he wear an electronic monitor, keep his distance from guns, and stay away from the girlfriend whom he pulled a gun on last week. The woman also claims Zimmerman tried to strangle her days before the incident. The choking accusation was disclosed for the first time by a prosecutor at Zimmerman’s first appearance Tuesday before Judge Frederic Schott, in a Sanford, Fla., courtroom. Zimmerman’s girlfriend, Samantha Scheibe, feared for her life because Zimmerman mentioned suicide and said he “had nothing to lose,” according to Assistant State Attorney Lymary Munoz. After the hearing, Zimmerman’s public defenders said he did not appear to be suicidal and expressed confidence he would be acquitted of any wrongdoing. Judge Schott said Zimmerman’s previous brushes with the law were not a factor in the conditions he imposed, but he did cite the new allegation of choking as a reason for the bond amount. Zimmerman faces up to five years in prison. His arraignment is set for Jan. 7. George Zimmerman has been charged with felony aggravated assault after pointing a gun at his girlfriend Samantha Scheibe. The incident happened at Scheibe’s home in Seminole County on yesterday. Zimmerman was also charged with two misdemeanors – domestic violence battery and criminal mischief. He is now being held in jail without bail and will make his first appearance in front of a judge today at 1:30 p.m. ET. A man is then heard telling her to calm down, but then she tells the dispatcher that the man just pushed her out of the house and locked the door. Zimmerman, however, made a call to 911 as well. He tells the operator that his girlfriend is “for lack of a better term, going crazy on me” and was throwing his things out. And also adds that the woman is outside with police. He insists that he never pulled a gun on Scheibe and that the firearm is locked up. But says she has the one that broke the table. When authorities arrived at the house, Zimmerman had the door blocked with furniture. But, was sitting calmly and unarmed. All guns were locked up when police arrived. He was passive and cooperative while being handcuffed. Earlier this month, Zimmerman’s ex-wife Shellie dropped charges stemming from a September domestic violence altercation that occurred at her Lake Mary home. George Zimmerman Threatens Wife and Father in Law With Gun? 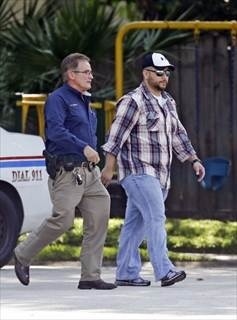 “He’s gonna shoot us,” proclaimed Shellie Zimmerman when she called 911 on husband George Zimmerman on Monday afternoon. But not even 24 hours later and George Zimmerman is no longer being detained by police after a confrontation with his estranged wife Shellie Zimmerman at her father’s home, according to multiple media reports. Lake Mary police chief, Steve Bracknell told The Huffington Post Mrs Zimmerman, called Lake Mary Police around 2:10 p.m. to report that her estranged husband had threatened her and her family with a gun and battered her father. Bracknell said George Zimmerman was detained at the scene. Attorney Mark O’Mara said the dispute between the couple at Mrs Zimmermans father’s Sprucewood Road house in Lake Mary was the result of heightened emotions from their ongoing divorce and proof that George Zimmerman was having an extramarital affair with a woman. He was later released without charges when his wife and father-in-law refused to press charges or give police a sworn statement. Police said they are reviewing surveillance video from the home and reserve. Hours later, Shellie Zimmerman changed her story and said she never saw a firearm, said Bracknell. For the time being, “domestic violence can’t be invoked because she has changed her story and says she didn’t see a firearm,” Bracknell said. The ordeal unfolded just four days after Shellie Zimmerman filed for divorce. Click Here to Listen to 911 Call!! method man accused of shooting woman with pellet gun? A woman from Fort Bend County, Texas is suing Method Man, alleging that the rappper shot her numerous times with a pellet gun as she attempted to get an autograph from Redman at the House of Blues in Houston. Method Man, born Clifford Smith, is accused of shooting the pellet gun from his tour bus window. Mary Anderson filed the lawsuit Thursday in a Harris County court. She claims she was struck at least six times in the chest and torso and required medical attention afterwards. The rapper, currently on tour with Redman and Ghostface Killah, is also accused of infliction of bodily injury, emotional distress and offensive physical contact. “The conduct of the defendant was so extreme and outrageous in character and so extreme in degree as to go beyond all bounds of decency and should be regarded as atrocious conduct and utterly intolerable in a civilized society,” Anderson’s Daniel Horowitz III of said. The defendant is seeking compensation for physical pain and injury, mental anguish, disfigurement, legal and medical bills. After winning 3 BET Hip Hop Awards on Saturday night and celebrating for the weekend, Lil Wayne was in court on Monday for drug and gun charges. Lil Wayne’s assistant testified that he occasionally saw a handgun and people smoking marijuana on the award-winning rapper’s tour bus. But witness Terry Bourgeois also testified Monday he never saw Lil Wayne with a gun and didn’t know whether one was on the bus in July 2007 when the 26-year-old rapper was arrested in Manhattan. A police officer testified last month she got on Lil Wayne’s bus after a concert because she smelled marijuana. She said that while on the bus she saw him attempt to conceal a gun. Defense lawyer Stacey Richman wants the charges dismissed. She says police falsely alleged they smelled marijuana so they could illegally board the bus. The rapper (real name: Dwayne Carter) has pleaded not guilty and is free on $70,000 bail.